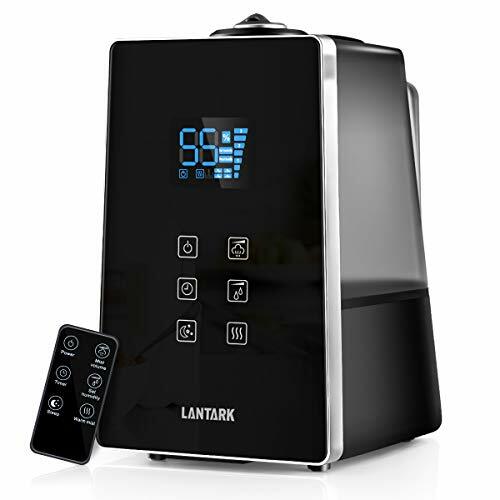 Lantark cool & warm mist humidifier is the perfect solution to relieve dry air symptoms and improve air quality. Warm mist helps eliminate germs, reliefs nasal congestion, dry skin and eyes discomforts,so you can breathe easy and sleep comfortably. Add a few drops of your favorite essential oil to the aroma box to relax with your favorite fragrances. Large capacity humidifiers can run continuously for 15-20 hours depending on mist control setting,easily cover large room up to 4200 cu ft.
Silent operation causes very little disturbance,noise less than 35dB,quiet enough so you can breathe freely and sleep well. Upgraded and easily viewed LCD digital display; sensitive,easy to operate touch screen. Touch button to start or use remote control to set the humidity easily according to your needs. Built-in intelligent humidity sensor can be customized humidity according to your needs.